On September 18, Toys “R” Us, Inc. filed for bankruptcy having reported increasing annual losses since 2013. The company stated that their brick-and-mortar stores and online sites will continue to operate. 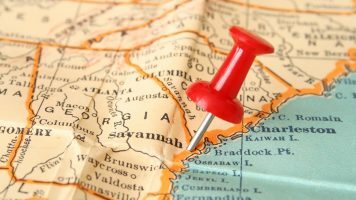 This development is only the latest in a string of recent bankruptcies and closings among major retail brands; e.g., The Limited, Radio Shack, Gymboree, Payless Shoes, Wet Seal. But seeing “Toys” on the ropes has a special poignancy for old retail hands. Toys was one of the first of the really successful big-box “category-killers,” offering huge assortments in stores averaging 35,000 square feet in size. Traditional toy merchants of the time — department stores and small specialists — could not compete. Many abandoned the category. In more recent times, the tables turned. 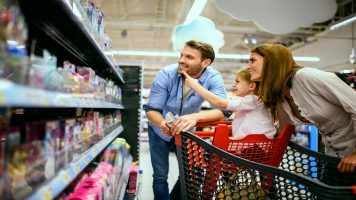 Walmart and Target created their own destination dominance in this product category, seriously eroding Toys’ market share. The dramatic growth of online retail — especially Amazon — has made matters much worse. 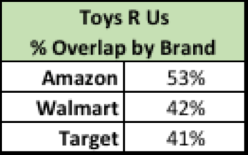 We thought it would be instructive to analyze Toys’ email footprint and performance, in relation to these other brands, to see how much of that exploration reflects the market difficulties Toys has had. The answer? Plenty. Herewith some data. Competitive pressure on Toys has been intensified by the substantial overlap (see table below) between Toys’ email audience and those of Amazon, Walmart and Target. Toys R Us shares more than half its audience with Amazon, and more than 40% of that audience with each of Walmart and Target. These other brands are competing with Toys on product, but also for inbox attention. These strong overlaps explain in part the impact of differentials in email footprint and performance we see in the table below, which shows Toys’ email activity, compared to that of Amazon, Walmart and Target for the critical peak Holiday sales period in 2016. Toys’ email audience is very significantly smaller than those of the other brands. The brand sent substantially fewer email campaigns during the period. 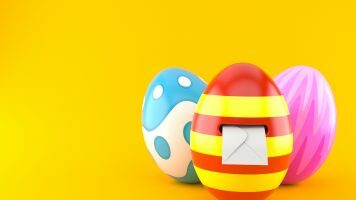 Even allowing for the fact that the competing brands’ email content wasn’t limited to the toys category, the much larger inbox presence of those brands gives them prominence well beyond Toys’ for the toys-related email they do send. Toys’ send volumes are about on par with those of Walmart and Target. But, given the much larger campaign flow of the latter two brands, we can infer that their email campaigns are of much smaller size and therefore likely to be more targeted than Toys’ campaigns. This difference has also been borne out in separate research we have done, as it also has for Amazon emails. At over 90%, inbox performance for all these brands is considered strong; the strongest being Amazon. Toys’ average read rate (13%) for the period is 2-6 percentage points lower than that of every other competing brand in the analysis. These email data neither tell nor explain the full story of Toys’ struggles over the years, but the data do reflect those struggles as they’ve played out in the Company’s overall performance. Toys has had a robust CRM database since at least 1996. 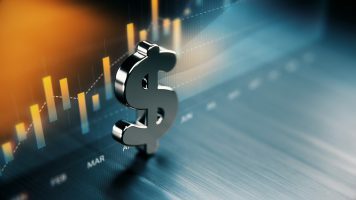 But fully leveraging that asset, given the Company’s heavy debt load, and the inability to invest appropriately in its online infrastructure, appears to have seriously impeded its ability to earn its way out of the financial hole it’s been in. The somewhat problematic in-store customer experience has also been part of the issue. There are many lessons here for old-line, multi-channel retailers trying to survive the digital and ecommerce juggernaut. Too many lessons for this space. But cross-channel integration is key, and optimizing email is definitely a part of the communication strategy supporting that.